Event "categories" make it easy to group together your various church events, courses and programmes. A busy church calendar can be then filtered by category to see just the information you need. Let's see what you can do with Categories. Every event added to the Calendar module must be assigned to a category. An event can only be assigned to one category. There's no limit to the number of categories you can have. Events display on the calendar in the category's colour. You can also assign a brand to a category so that all event pages and communications for events within that category sport your chosen brand logo, emblem and styling - ideal for giving your youth ministry a common branding. It's not possible to delete a category that contains events (past or future); however you can re-assign those events to another category first and then delete the empty category. Ordinarily you'll set the category colour when first creating the category. The category colour affects how the event is displayed on your ChurchSuite calendar, and on the embedded calendar, if you are using it . To set a brand colour for your category, see the "Brands" section within the related support article on "Personalising your ChurchSuite account". To change the category colour on your ChurchSuite calendar, go to "Calendar" > "Categories". Select Edit from the action cog on the right hand side of the screen. Select the Colour option - as you click the box, a number of preset colour options will appear - select as desired, or type your own hex colour code. Click Save when you are finished - all the events in this category will appear on your calendar in this colour. Can't find the colour you want? You don't actually have to select one of the preset colour options - you can type any hex colour code into the box. A great way to find the right colour code for the colour you want is Adobe's "Kuler" tool. See the related support article "How to personalise the appearance of your ChurchSuite account" for how to create a new brand. Once created, you can easily assign a brand to an event category so that all events within that category will sport your brand on public facing event pages, event check-in, sign-up confirmation emails and optionally on emails sent from the event page in your Calendar module. To assign or change a brand on a category, "Calendar" > "Categories". Select Edit from the action cog on the right hand side of the screen. Notice in the screenshot below how the current Brand is shown in your list of categories. Use the Brand drop-down selector to select the appropriate brand from the list. Remember to save your changes before navigating away from the page. 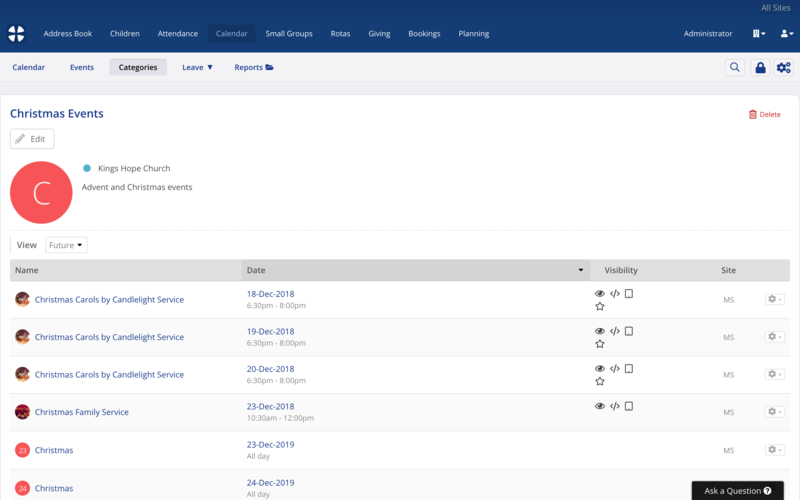 Since your church's Calendar module's events (past, present and future) are always linked to a Category, deleting a Category would ordinarily delete all events associated with that category. ...or press the Delete button in the top right corner of the category's page. To avoid loss of event data - including event sign-ups, tickets, ticket payments, sign-up question responses, check-in data, etc - when deleting a category, the user is prompted to select (or create) an alternative category for associated events, past and future, to be transferred to - perhaps an "Archived Events" category. Importantly, you must ensure the alternative category exists before running the "delete category" process; since you are required to select the new category during the delete confirmation process. Once you have confirmed, click Delete. ChurchSuite will re-assign all associated events (and linked data) to the new category before finally deleting the old category and briefly displaying a success message.